Alaska Airlines has launched their next buy miles bonus of 2018! The 40% bonus is their ongoing bonus these days and is always decent but we do see a 50% bonus several times per year so unless you need the miles right away we would wait to buy. Remember there is also no limit to the number of miles you can buy each year, you are simply limited to a maximum of 60,000 miles pre-bonus per transaction. 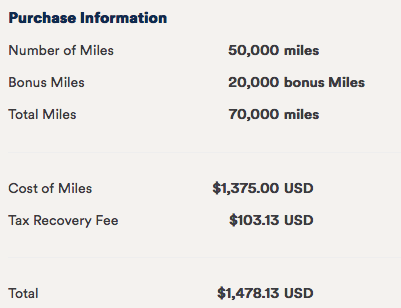 The last offer saw the 40% bonus kick in at the 40,000 mile level while this time you can score that bonus with a lower purchase of only 30,000 miles. Seeing that you can redeem miles for premium class flights on British Airways, Cathay Pacific, Hainan, Korean Air and more, there are lots of options for you to use these miles. Remember it only takes 70,000 Mileage Plan miles to fly Cathay Pacific First Class one way from North America to Asia and those 70K will cost you $1478.13 as seen above - and to pay for that first class ticket will cost you a lot more than that!